My parents tell me what an imaginative child I was. According to them, I concocted a plethora of imaginary friends (most of them lizards) and an entire enchanted kingdom for them to inhabit, which I termed Magic Land. I also invented a correspondingly evil realm, which housed my fears and dislikes, called Thunder Land. I would discuss the geography, architecture, and politics of these fictional dominions in vivid detail for anyone who would listen. I have always considered stories like this inspirational—proof that even at a young age, I was a creative person. So it was jarring to re-watch Little Nemo: Adventures In Slumberland and discover I had ripped it off wholesale. As a kid, I’d sit mesmerized, watching our VHS of the movie over and over, and I evidently appropriated its entire universe without realizing it: The Magic Land of my childhood imagination was nothing more than the film’s Slumberland, and my Thunder Land was just a personalized version of the villainous Nightmare Land. Then again, maybe it’s not surprising that Little Nemo would have seeped into my subconscious—fluent, as it is, in the language of dreams. After seeing a circus parade, our hero, Nemo, asks his parents to take him to the show. They decline, saying they’re too busy. That evening, Nemo is caught sneaking some pies, despite having promised his mother he wouldn’t. When he falls asleep, he’s whisked away to the dream world of Slumberland, where he meets the pompous Professor Genius, the petulant Princess Camille, and the mischievous Flip, all of whom resemble figures from the parade. After being crowned prince, he inadvertently unleashes the evils of Nightmare Land and must rescue King Morpheus. In the end, he wakes up at home, apologizes to his mother, and gets a trip to the circus. Throughout his adventures, Nemo is forever flying, falling, drowning, running from pursuers, or trying in vain to get through a crowd, all of which are common dream scenarios. This insight into the subliminal, along with the cast of characters and the opulent dreamland iconography, comes directly from the movie’s source material, an early 20th-century comic strip by Winsor McCay. McCay’s importance in the world of animation is hard to overstate. His seminal comic strip, Little Nemo In Slumberland, pushed the bounds of the medium with its experiments in form and pacing, and his short films Gertie The Dinosaur and Little Nemo (also known as Winsor McCay, The Famous Cartoonist Of The N.Y. Herald, And His Moving Comics) were among the earliest animations ever produced. His works have inspired everyone from Walt Disney to Robert Crumb. McCay’s legacy helps explain the pool of talent involved in Little Nemo: Adventures In Slumberland. During its lengthy production history, luminaries such as Hayao Miyazaki, Brad Bird, Robert Towne, Chris Columbus, and Ray Bradbury worked on it in some capacity, and the Oscar-winning Sherman Brothers wrote the songs. A Japanese-American co-production, it appears to be one of the first anime features to receive wide release in the United States. 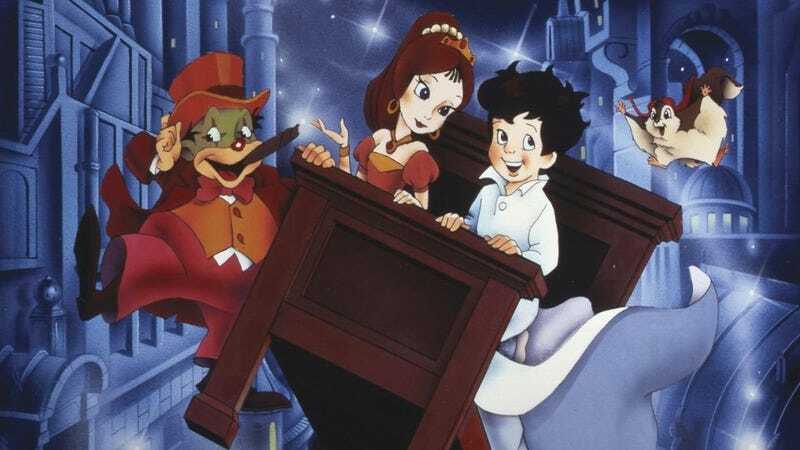 Yet despite this notable pedigree, Slumberland tanked at box offices here and in Japan (although it did find a second life on video, thanks to some creative tie-ins with Tropicana). In retrospect, there were signs of trouble. George Lucas and Chuck Jones turned down the project. Miyazaki left during preproduction over creative differences. Brad Bird stayed for only a month, exiting after he spoke to artists who said they were “just illustrating what Ray Bradbury is writing” and heard from Bradbury that he was “just putting in writing what these wonderful artists are drawing.” Even beyond these issues, though, the movie was tasked with adapting a beloved and fundamental turn-of-the-century animation into a family feature for modern audiences. With such high expectations, it was almost guaranteed to disappoint. Unencumbered by any of this knowledge or expectancy in my youth, I enjoyed the movie as a freewheeling, kaleidoscopic, somewhat spooky adventure story. Watching it with the jaded eyes of experience, much of the luster is gone. The storytelling in Little Nemo is episodic, full of fits and starts. The little exposition needed to propel the plot is clunky, trotted out right before it pays off. Professor Genius laments, “Oh dear, a prince late to a crowning is a capital sin,” moments before Nemo arrives. King Morpheus explains offhandedly that a magical scepter is the only defense against the Nightmare King, and in the next scene Morpheus is kidnapped by said villain. Characters appear and vanish when convenient, the laws of the natural world are enforced and discarded, and Nemo’s relationships are assumed rather than earned. It would be tempting to chalk this all up to dream logic, but there are issues even in the waking portions of this movie. Nemo’s father, for instance, is a thinly sketched workaholic, perpetually telling his son, “Maybe tomorrow.” Yet when Nemo wakes up at the end of the movie, his father is unaccountably cheerful, promising a family trip to the circus. He has a Mr. Banks transformation without any Mary Poppins to propel it. There’s also the problem of Icarus, Nemo’s real-world flying squirrel pal. Adorable and unintelligibly squeaky, he’s a typical Disney-style sidekick who was created specifically for this film. Even putting aside his irritating demeanor, Icarus just doesn’t fit. With his aviator goggles, puckish attitude, and ability to fly, he’s as wondrous as much of what we see in Slumberland—blurring the distinction between the dream world and reality in an unhelpful way. In spite of these weaknesses, there is still something magical about Slumberland. Though designed by committee, individual artists’ talents are recognizable in the finished product. There are shades of Chris Columbus’ jaunty energy and Ray Bradbury’s eye for the uncanny. Miyazaki’s touch is even stronger. His Studio Ghibli produced a pitch whose aesthetic had a clear impact on the final film. And the original imagery of McCay’s boundless imagination endures. It remains enchanting to watch Nemo’s bed soar through the air or sprout legs and dash through the New York night. This potent exploration of the unconscious is Little Nemo’s greatest strength and saving grace. Consider the scene in which Nemo first cavorts with his new playmate, Princess Camille. They soar through the air and land in some big squishy balls connected to a tulip-like aircraft. The tulip penetrates the clouds and releases the playmates’ balls. They bounce around and don butterfly wings before ending up naked, ensconced in dandelion puffs. There’s an undeniable sexuality to these scenes, but it’s all coded through the wondrous and pre-adolescent filter of Nemo’s dreams. The film’s understanding of nightmares is equally adept. The emotional engine of the narrative is Nemo’s guilt over stealing food, and this plays out in his nighttime fantasies. The most terrifying scene—and the only one I had remembered from my youth—finds the black ooze of Nightmare Land escaping through the forbidden door that Nemo unlocked. As the ooze permeates Nemo’s coronation and engulfs Morpheus, our hero tries desperately to reach him through the crowd, to no avail. Nemo disobeyed Morpheus by opening the door, just as he disobeyed his mother by sneaking pies, and that sublimated betrayal of a parental figure is wrenching. The gradual unveiling of the dark realm is also savvy. Though Nightmare Land is established early on, Nemo doesn’t enter it until the final act. And while it’s more rife with cute critters than one might expect from a place of evil, the Nightmare King himself remains enigmatic, glimpsed only briefly in the film’s climax. Up to that point, nightmares are portrayed as an alien, annihilating force, inviting viewers to fill in the gaps with their own fears. Adventures In Slumberland is an appropriately Morphean hodgepodge of influences, messy and murky, sometimes frustrating, often nonsensical, and occasionally revelatory. The movie is available in full on YouTube, and it’s well worth a watch. For all its flaws, it retains a visceral appeal, suggesting that a world of untold wonder and horror exists on the periphery of our consciousness. That sense of the unknown and the unknowable is transfixing, and it drew me to the film as a child—like a dream, it was quickly forgotten, but buried deep in my imagination.